The Content Marketing Institute has been sharing wisdom from its contributors in a wonderful series of crowd-sourced posts about content marketing. Have you had a chance to read them? I particularly love data that tells a story. FastCompany does a beautiful job via its “Infographic of the Day” showcasing data while telling a story. Here’s a recent example that features interactive maps created by Trulia and featured on theTrulia blog. [Trulia, by the way, is another example of a company that has radically reinvented a category - real estate - by making data meaningful for home buyers through content.] From FastCoDesign: Infographic Of The Day: How Men And Women Differ When Making Big Sales [i.e., real estate]. Note how the FastCompany article provides context and meaning so the reader can’t help but want to explore the interactive charts… and share it with others. Do you think the data reflects how you buy real estate? 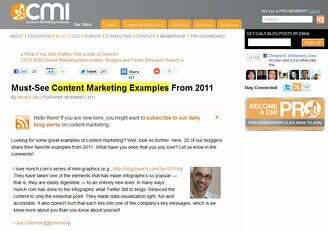 What is your favorite Content Marketing Example of 2011? What do you think of the examples captured in CMI's blog article?